The value of a Beaver - 3 pence 1851 stamp depends on several factors such as quality and wear, supply and demand, rarity, finish and more. Values in the section are based on the market, trends, auctions and recognized books, publications and catalogs. This section also includes information on errors and varieties and characteristics. 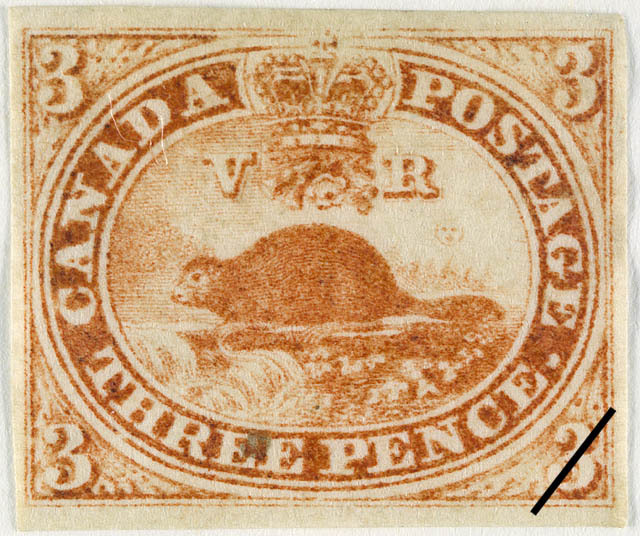 The first postage stamp issue of the Province of Canada featured the beaver on the 3-pence, H.R.H. Albert, husband of the queen, on the 6-pence denomination, and Queen Victoria on the 12-pence. These stamps were produced on laid paper without perforations. Rawdon, Wright, Hatch and Edison, the New York security printers, received the contract to print Canadian postage stamps, producing all the requirements until May 1, 1858. On that day the company name changed, following amalgamation, to the American Bank Note Company with headquarters remaining in New York City. The new firm continued the former printing contract until Canadian Confederation in 1867. Sandford Fleming, a young civil engineer and draughtsman, designed the 3-pence stamp under the direction of the Honourable James Morris, Postmaster General. He also prepared the artwork with a similar beaver motif for a 1-shilling denomination which never appeared as a finished postage stamp. Sandford Fleming's most important work concerned railway construction in Canada, and for his work Queen Victoria knighted him. He became chief engineer for the Intercolonial Railway (1857-76), and for the Canadian Pacific Railway (1871-80). In 1872 he was in charge of the Ocean-to-Ocean Expedition undertaken to find a route for the Canadian Pacific through the Yellowhead Pass. During these years he devised the system of time zones. From 1881 until his death in 1915 he served as Chancellor of Queen's University at Kingston. The 3-pence denomination featuring a beaver building a dam was symbolic of the people in the young country of Canada building their towns, cities, and communities. The secondary purpose of choosing the beaver centred in the original meaning of the beaver skin; it represented a medium of exchange in trade.